Vicor Corporation has announced a 3-phase, ac-dc converter module (the RFM), capable of delivering 10kW of regulated 48Vdc in a power tablet configuration measuring 9.4 x 5.9 x 0.6in (24 x 15 x 1.5cm). The RFM™ provides a power-factor-corrected, regulated, and isolated dc output with integrated filtering and built-in fault protection for redundant operation. The RFM can be configured to accept worldwide 3-phase ac mains from 200- to 480-Vac. The RFM has an ideal mechanical interface for extracting heat with a tablet form factor providing a high surface area to volume ratio. Conventional ac supplies are typically designed only for air-cooled systems, having an irregular surface profile and non-uniform heat distribution. The RFM is designed to easily integrate within advanced cooling systems including liquid cooling (cold plate mounting) and liquid immersion. 48V (including 54Vdc) distribution is the emerging standard in high-power racks utilizing smaller-gauge wiring, and achieving substantially lower distribution losses than legacy 12Vdc distribution. The RFM, Power-on-Package and Direct-to-PoL solutions are all part of an ecosystem of regulating converters suitable for powering a wide variety of loads and auxiliary power rails directly from a 48V bus. 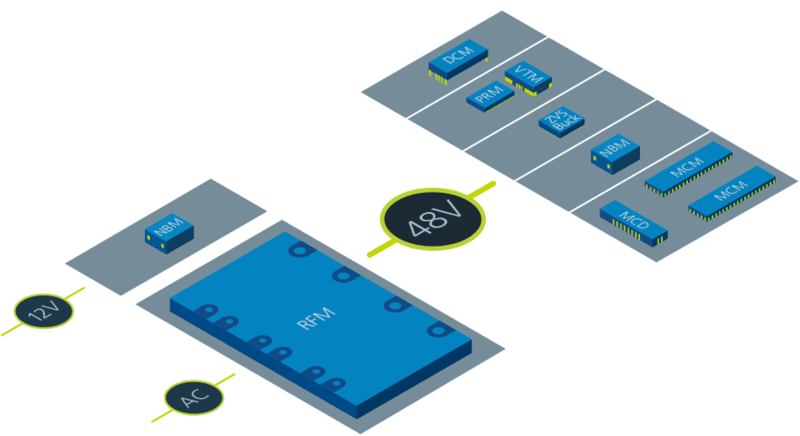 In combination with Vicor 48V Power-on-Package (PoP) and 48V Direct-to-PoL solutions, the RFM enables dense and efficient end-to-end power system solutions, from 3-phase ac to sub-1V AI processors at the point-of-load. 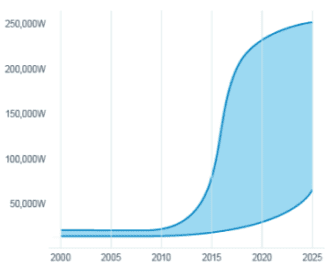 As demand for processing power has grown – driven by data-intensive applications, such as AI, cloud computing, machine learning and big data – so too has power consumption and heat generation in data centers. Range of rack power observed. Because all of the power used by data center computers is derived from ac utility lines and processed by system power supplies, the density and efficiency of the power system, including the front end that transforms the ac line voltage into the dc voltages required for powering electronic circuitry, is of paramount importance. Increased power system efficiency and density translate into reduced losses, reduced cooling requirements, improved space utilization and greater economy. The new Vicor RFM was designed specifically to address these issues. Four RFMs operated in parallel – including optimal hold-up capacitance, rectification and fuse/safety circuitry – can deliver 40kW of power in a traditional 1U of rack space. Alternatively, the RFM can be distributed throughout the rack volume allowing for a new degree of freedom in mechanical and thermal solutions. The 10kW power tablet RFM is the first in a new series of single and 3-phase ac-dc modules featuring power outputs from 150W to 15kW.